When you're thinking about family-friendly vacation destinations, Las Vegas probably isn't the first (or second, third or 15th) location on your list. Rather than inspiring touching memories of fatherhood, Las Vegas likely calls to mind gambling, showgirls, alcohol and Mike Tyson with a tiger. While, yes, most of those things can definitely be found in Sin City, there's actually a number of things in Las Vegas that are appropriate for kids. Here's a short list. Live shows – One of the things Vegas does have in abundance is shows – and a well-done show can blow kids' minds and get them thinking. You will need to do your research on the specific show, since many will have more adult-focused content than you would want your kids seeing . For example, shows like the Blue Man Group at the Monte Carlo might be right up kids' alley, while other ones may be a bit too racy. The city also has an abundance of magic shows, so see if any of them seem a good fit for your family. If your kids are a bit more grown-up, you may be able to bring the kids to one of the edgier shows. Once you've chosen the show that's right for you, all you have to do is sit back, relax, and watch your children's boredom disappear. 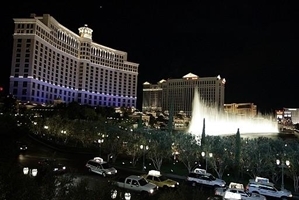 Bellagio attractions – Need something simple (and cheap) to do when you're in Las Vegas? Step outside of the casino, and head for the sidewalk in front of the Bellagio fountains. They're programmed to go off in an exciting pattern – complete with lights in the evening – every 15 to 30 minutes, and regularly draw a crowd. If you're not sure what I'm talking about, then watch any movie set in Las Vegas from the past 15 years. It's in there. When you want to go back inside, the Bellagio has a number of family-friendly attractions you can visit, including a botanical garden and an art museum. The garden even has live music twice each evening, and – because it's Vegas – is open 24/7. Pinball Hall of Fame – There's a museum for everything, and Las Vegas is home to the Pinball Hall of Fame. It's actually located right near the strip, and offers 10,000 square feet of games dating from the 1950s all the way up to the 1990s. Most of the machines are 25 or 50 cents per play, so you really get your money's worth compared to the craps and blackjack tables. Plus, playing games with your kids is a fun Dad activity, and will keep your more entertained than other activities that can sometimes feel like babysitting. The museum also operates as a nonprofit organization – standing in stark contrast to everything else in Las Vegas. Literally any excess revenues collected through the machines, machine repair work and DVD sales (Yes, they made a DVD) are donated to local charities, such as the Las Vegas Salvation Army branch. Grand Canyon – Yes, I know this one is kind of cheating, but when you are in Las Vegas, visiting the Grand Canyon is a great idea for a lot of ways. There are a number of companies, such as Adventure Photo Tours, that can pick you up right from your Vegas hotel and take you out to the canyon. It's one of those U.S. landmarks that pretty much everyone wants to see at some point in their lives. However, many people never actually go because it's literally in the middle of nowhere in northern Arizona. If you do decide to make the trip, keep a few key things in mind. Las Vegas is a four-hour drive from the Grand Canyon, so plan to keep your kids occupied somehow. Because of the travel time, the tours that leave from the strip tend to depart early in the morning – sometimes by 8 a.m. So you need to plan your activities for the night before with a little bit of caution. These are just a few activities in Las Vegas that break away from the "traditional" activities Las Vegas has become famous for, and there are many others on and off the strip. So stop thinking that Sin City is just a never-ending hangover and create some family-friendly memories too.